So I finally finished my first multimelta attack bike (one of two). A bit more work than a regular biker but not as tough as I thought it was going to be in the end. I added the lightning bolt to the side car wheel cover as a way of marking which attack bike is which. The second one is going to have a skull. Since this post is quite old now... I've been able to refine my "white" and have a much quicker process for painting models white. The new technique is here. Great work on the white, as always! Awesome job as always. You are a braver soul then I painting all that white. The barrel of the multi-melta looks very nice also. Tupping lovely, your white is so smooth and flawless looking. 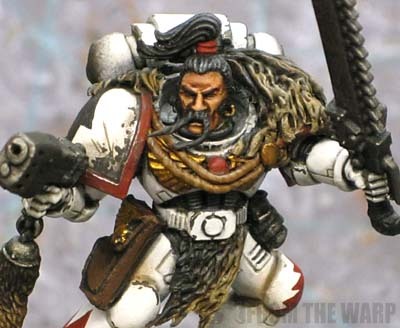 Do you just work up through grey or do you prime white? eek: I have no real reason for the skin color other than I like the way it looks. The regular "flesh" color has just gotten old for me. I like the light brue-grey color and it's not something you see often. He does look kinda "Tau-ish" now that you mention it though. oni: The white is going to be the death of me. It takes so long to do but in the end it's worth it. Now I know why you don't see white armies. Vredesbyrd: Thanks, I work up through a middle value grey (the color left between the plates). Great looking piece. Nice work, Ron! Zealot: I've got 1500 points, just not all of it painted yet. I've got most of the terminators still left ot finish. I can come up with 1200 points easily if you don't mind just assembled models for now. Excellent painting, if it plays as good as it looks that multi-melta will cause some damage on the table. Also perplexed by the Tau skin color but its well done regardless. bike and side car how great can you get, i mean if it is as good on the battle feild than how it looks im getting 4.weve got a real life bike and side car and i bet that would look better with a multi melta onit . 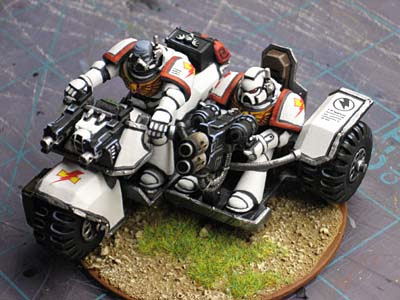 i paint my men white scars and i dont think you could go wrong with a white scars attack bike with a multi melta, the opposing side should be afraid espeically if there orks, when your battling them with the masters of hit an run themselfs with 2 or 3 attack bikes dont stand a chance. Jack: He's more of a pale blue. I was experimenting with different skin tones on models and wanted to see what I could come up with other than "flesh." I wish I had a better, more cool answer for you.